"This project has taught me that you can indeed put lipstick on a pig," joked Mark Dickinson as he stood atop the Town of Reading’s former municipal dump and landfill. Standing on a hill of compacted dirt at the edge of a recently excavated foundation site, some 40 invited guests— including members of the development team and local and state officials — were on hand November 17 for groundbreaking ceremonies for Phase II of the $90 million Crossing at Walkers Brook retail center. In the background was the just-completed Phase I part of the project consisting of Jordan’s Furniture, Home Depot and Chili’s Restaurant. Across the way, giant bulldozers moved piles of dirt as Phase II construction commenced. The completed project will consist of a total of 475,000 square feet of prime retail space. Mark Dickinson, President of Dickinson Development of Quincy, Mass., developer and partner in the 33.5-acre project, announced that before the first shovels were in the ground for Phase II — and nine months before the projected completion date in mid-2005 — he already has commitments for about 97% of the 75,000 square feet of retail space. Future tenants include Staples, Linens 'n Things, The Paper Store, Roman's Macaroni Grill, Bear Rock Sandwich and Specialty Restaurant, Bank of America, Starbucks, and another retailer. Only 2,000 square feet remain. Reading Town Manager Peter Hechenbleikner told attendees, "This is a remarkable project that our community began working on in 1986. We've attained my dream of turning trash into cash. Because of this success story, other properties in town are now in the development mode." Board of Selectman Chair Gail Wood said, "I used to bring trash to that dump. This project represents an unusual public-private partnership in which town departments and the development team worked so well together." Also in attendance were State Senator Richard Tisei, and State Representative Brad Jones. Dickinson said, "Each of you here deserves a major 'thank you.' In 25 years in business, I’ve never worked with people who had a better can-do attitude without ever compromising their values. It took the Red Sox 86 years to win the World Series. It took us exactly 86 weeks to get to this point." On behalf of the development team, Dickinson presented a check to the Friends of Hunt Park, a group that maintains a local park for area residents' recreation. He thanked members of the development team including project partner Pinnacle Partners; construction consultants and contractor Pinncon, Inc.; architects Carter-Burgess; and engineering firms Haley & Aldrich, VHB, Inc., and Dufresne-Henry, and Morris & Morse Co, Inc., of Boston who served as financial advisor to Dickinson. Financing is by Eastern Bank. Leasing for the center is handled by The Wilder Companies of Boston. 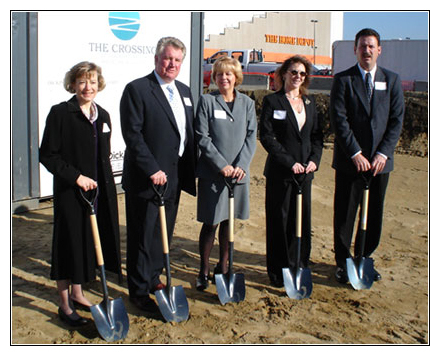 Company staff who joined some 40 other project team members and local and state elected officials for the historic Groundbreaking Ceremony are: (left to right) Project Manager Taryn Warren; President Mark Dickinson; Controller Margie Bjork; Office Manager Sandy Smith; and Vice President/Construction Ed Shaw.